Founder and Owner of “Solid Gold Health Products For Pets, Inc.,” Sissy Harrington-McGill raised Great Danes in the United States, but discovered while on a trip to Germany to acquire a championship bloodline dog that the Great Danes that were bred and grew up in that country had a significantly longer life span. After analyzing various foods to determine how she might lengthen the life span of American Danes, in 1974 she developed and launched the first natural pet food category in the United States with the introduction of her flagship product “Hund-N-Flocken” dog food, which means ‘dog food flakes’ in German. 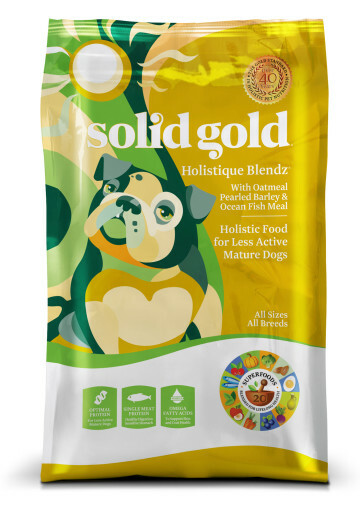 Now, more than 40 years later, as America’s first holistic pet food brand, Solid Gold has a well -developed line of natural and holistic dry foods, canned foods, treats and supplements. 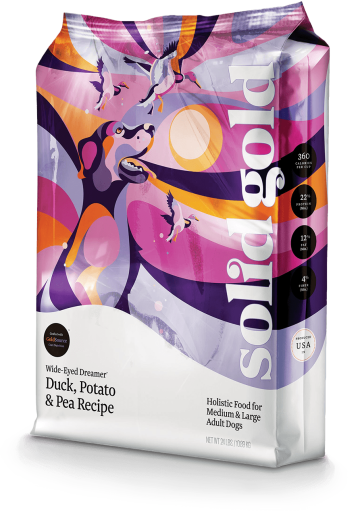 Solid Gold specializes in the development of dry and wet dog food which contains no preservatives, or saturated fats. The formulas are made of USDA Choice meats and grains, such as whole grain brown rice, barley, oats and millet, with no meat by-product meal, corn, wheat, soy, sugar, artificial preservatives, or flavours added. 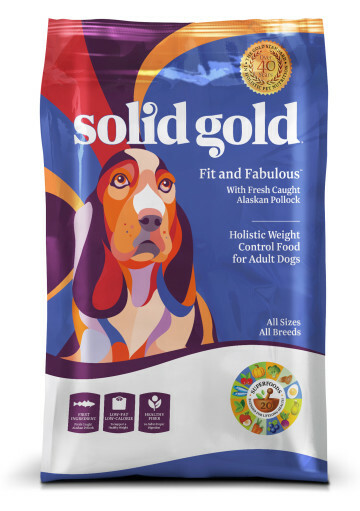 Solid Gold not only offers a complete line of dry and canned foods, but also treats, supplements, as well as, skin and coat care products designed to meet the needs of all dogs throughout their lives. Where is Solid Gold manufactured? Although their website mentions that the “Solid Gold” headquarters is based in Greenville, South Carolina, it does not specify where their products are manufactured. The company is at the moment in the process of moving their headquarters to St. Louis, Missouri. 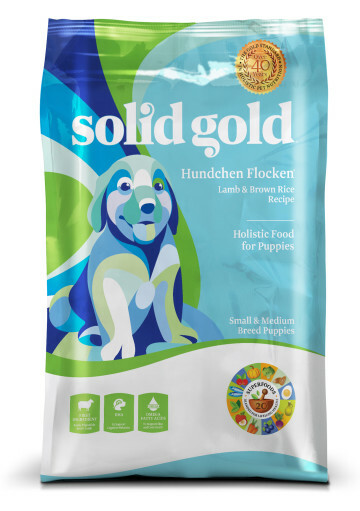 There is a statement on their “Solid Gold Pet Nutrition” Facebook page specifying that “Diamond Pet Foods” manufactures four Solid Gold® dry dog foods: WolfKing, WolfCub, Just a Wee Bit, and Hund-N-Flocken. The remainder of their dry dog foods are made at Crosswinds Pet Foods, in Kansas. All WolfKing, WolfCub, Just a Wee Bit, and Hund-N-Flocken sold in the United States are made at the “Diamond Pet Foods” plant in Meta, Missouri. The “Diamond Pet Food” plant in Gaston, South Carolina, makes a very small amount of WolfKing, WolfCub, and Just a Wee Bit for export purposes. 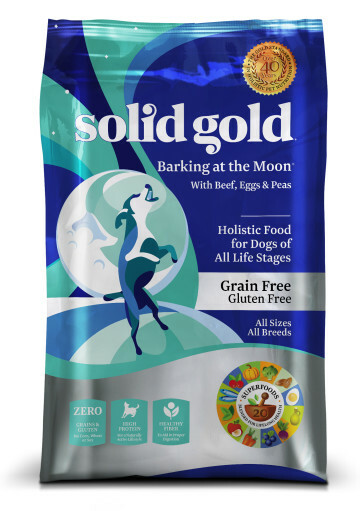 Solid Gold has thirteen “Gluten/Grain Free” formulas. Six of the “Gluten/Grain Free” formulas are also high in protein, and one consists of ‘small kibble’ for puppies and small breeds. There are eleven “Healthy Whole Grain” formulas, two that are geared towards ‘weight control’ and three ‘small kibble’ formulas for puppies and small breeds. 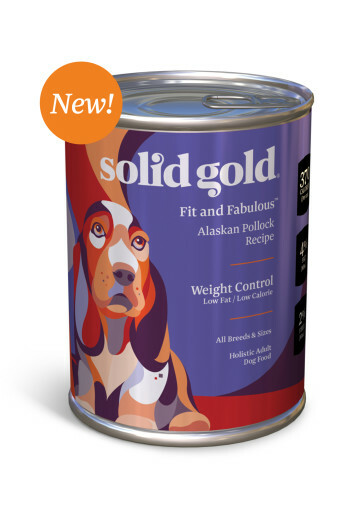 Solid Gold also has eight “Grain/Gluten Free,” three “Healthy Whole Grain” and one “Weight Control/Low Fat, Low Calorie” wet food formulas. Solid Gold only uses quality ingredients. Their quail duck and rabbit are sourced from France, their lamb from New Zealand, venison from Australia, Alaskan Pollock from Alaska’s Bering Strait and their turkey, chicken and beef from the United States. Holistic food for dogs of all life stages. The primary ingredients are ocean fish meal, beef, pea protein, potatoes, canola oil (preserved with mixed tocopherols), dried eggs, peas, tomato pomace, natural flavours, potassium chloride, Salmon oil (preserved with mixed tocopherols), taurine. Holistic food for adult dogs of all sizes. The primary ingredients are quail, chickpeas, peas, potatoes, turkey meal, tapioca, pea protein, pork meal, canola oil (preserved with mixed tocopherols), pumpkin, dried eggs, pollock meal, pea fiber, sweet potatoes, natural flavours, dicalcium phosphate, potassium chloride, salt, DL-Methionine, salmon oil (preserved with mixed tocopherols). The primary ingredients are chicken, chicken meal, peas, tapioca, whitefish meal, canola oil (preserved with mixed tocopherols), tomato pomace, quinoa, dried eggs, potatoes, sweet potatoes, chia seed, natural flavours, flaxseed. Holistic evolutionary food for adult dogs of all sizes. The primary ingredients are beef, beef meal, peas, pea protein, chicken fat (preserved with mixed tocopherols), garbanzo beans, potato protein, egg product, ocean fish meal, buffalo, tomato pomace, flaxseed. Holistic food for toy and small breed dogs of all life stages. The primary ingredients are chicken, chicken meal, chickpeas, peas, sweet potato, pea protein, chicken fat (preserved with mixed tocopherols), pollock meal, canola oil (preserved with mixed tocopherols). Holistic dry food for medium and large adult dogs. The primary ingredients are duck, peas, chickpeas, turkey meal, pearled barley, brown rice, canola oil (preserved with mixed tocopherols), rice bran, pollock meal, dried eggs, pea fiber, dicalcium phosphate, flaxseed. Holistic food for adult dogs. The primary ingredients are beef, ocean fish meal, pearled barley, brown rice, peas, white rice, dried eggs, canola oil (preserved with mixed tocopherols), rice bran, tomato pomace, flaxseed. Holistic food for medium and large breed puppies. The primary ingredients are bison, ocean fish meal, brown rice, oatmeal, peas, rice bran, pea protein, pearled barley, dried eggs, canola oil (preserved with mixed tocopherols), natural flavours, tomato pomace, flaxseed. Holistic food for small and medium breed puppies. The primary ingredients are lamb, lamb meal, ocean fish meal, brown rice, peas, pearled barley, pea protein, canola oil (preserved with mixed tocopherols), rice bran, tomato pomace, dried eggs, flaxseed. Holistic weight control food for adult dogs. The primary ingredients are pollock, pollock meal, pea fiber, oatmeal, pearled barley, turkey meal, peas, brown rice, tapioca, dried eggs, canola oil (preserved with mixed tocopherols), natural flavours, flaxseed. Holistic food for less active, mature dogs. The primary ingredients are oatmeal, pearled barley, peas, ocean fish meal, canola oil (preserved with mixed tocopherols), dried eggs, flaxseed, tomato pomace. 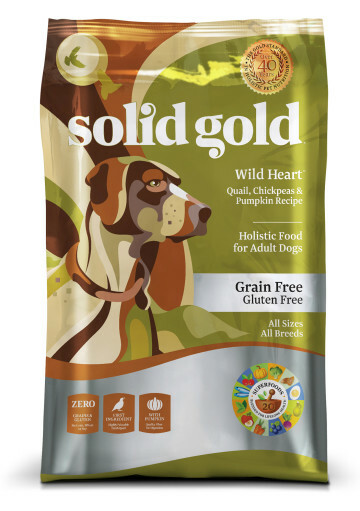 Holistic puppy and adult dog food. The primary ingredients are chicken, chicken broth, water sufficient for processing, chicken liver, dried egg whites, potato starch, peas, chickpeas, pumpkin, carrots. 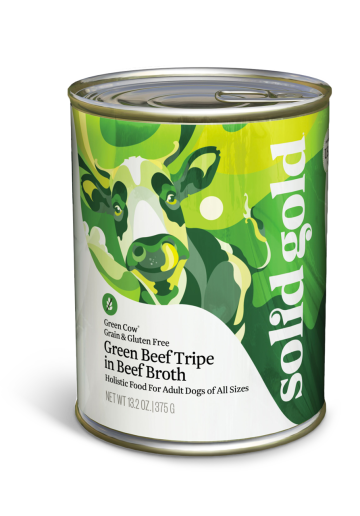 The primary ingredients are green beef tripe, beef broth, potatoes, canola oil, tricalcium phosphate, carrageenan, salt, potassium chloride. 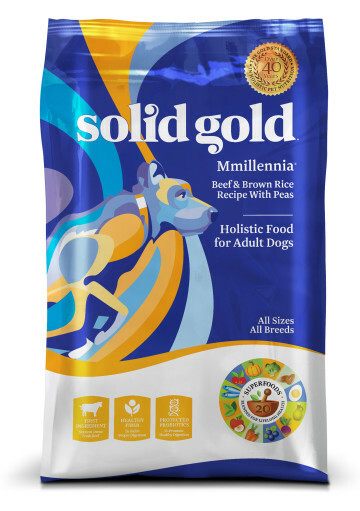 Holistic puppy and adult food. The primary ingredients are chicken, chicken broth, chicken liver, ocean whitefish, ground brown rice, barley, barley, carrots, guar gum, oatmeal, alfalfa meal, flaxseed meal. The primary ingredients arelamb, water sufficient for processing, lamb liver, ground brown rice, carrots, barley, canola oil (preserved with mixed tocopherols), guar gum, oatmeal, alfalfa meal, flaxseed meal. The primary ingredients are pollock, turkey, ocean fish broth, turkey liver, carrots, pea fiber, alfalfa meal, ground flaxseed. 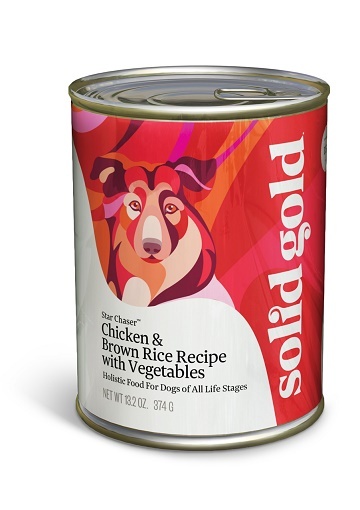 A limited number of Solid Gold’s “Wolf Club” line were voluntarily recalled in May 2012 for suspected salmonella. The bacteria was discovered in Diamond Pet Food’s Gaston, South Carolina plant. 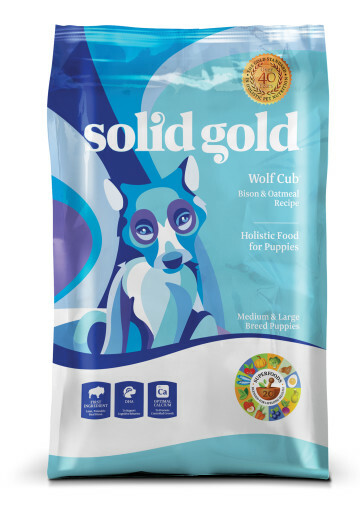 The manufacturing contract between Solid Gold and Diamond Pet Foods was terminated in April 2012, leaving the company with little supply of WolfCub, WolfKing, and Just a Wee Bit and no definite manufacturing plans. They spent the next three months searching for a new manufacturer for the three bison foods, but to no avail. They could not find a facility to meet their needs. Many plants did not have the capacity to bring in their lines, or have the technology for meat inclusion, therefore, could not source some of their unique ingredients. In the end, they reconciled with Diamond Pet Foods. 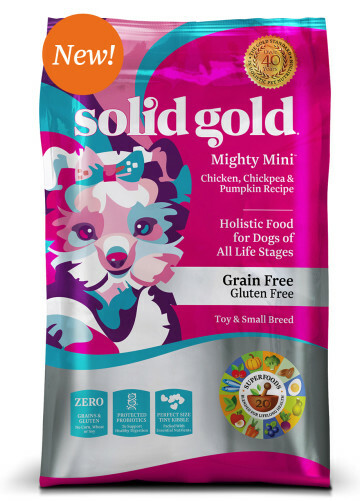 Even though Solid Gold had no indication that their recalled foods were ever contaminated they initiated new quality control protocols including a positive release program, for additional reassurance. For those of you not familiar with a “positive release program,” all batches of food are tested for salmonella at an independent lab before the food is released from the manufacturing facility to their warehouse. Their other plant, Crosswinds Pet Foods, already operates a positive release program. 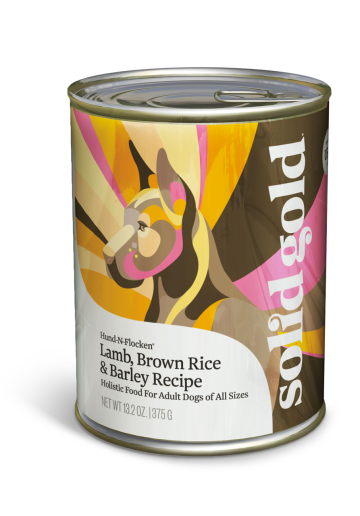 Judging by the ingredients found in the various Solid Gold dog food formulas, it appears to be a premium dog food. There is a notable amount of meat in both its dry and wet food formulas, as well as, nutritious fruits and vegetables. According to the contents of the various formulas, it appears that the grain free formulas rank the highest in nutritional value. 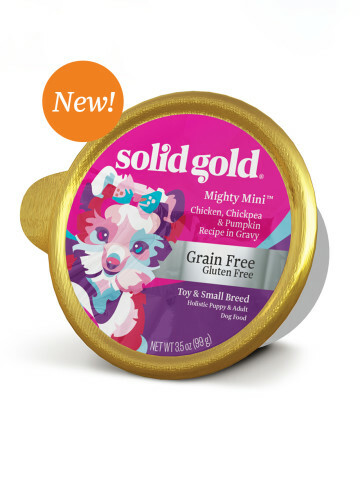 Solid Gold grain free formulas are an excellent choice for dogs that may be allergic to grains, glutens, or other ingredients. 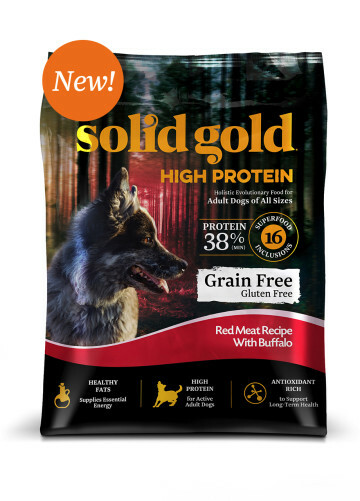 Their meat-based ingredients contain large amounts of fresh beef, chicken, and freshly caught fish without any grain additives, which offers your dog a diet that is as close as possible to what they would consume in the wild. Even though some formulas contain grain additives, the sources are from healthy grains and not from wheat, therefore, also making them a nutritious choice. 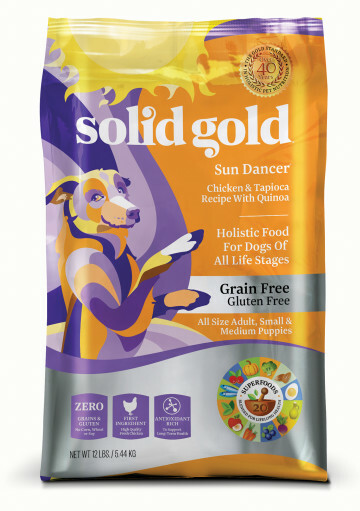 Overall, Solid Gold dog food formulas appear to be a healthy choice to maintain optimum health of your canine friend. 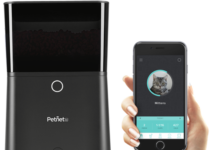 Find out what your dog needs the most and choose the most appropriate formula, according to their requirements.